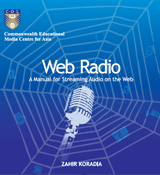 In May 2013 Gram Vaani worked with CEMCA (Commonwealth Educational Media Center for Asia) to organize a workshop on how educational institutions can easily set up an Internet radio station on their campus, supplemented with Mobile Vaani based interactions. Web radio is an increasingly popular, low-cost option for community radio given the complex legal processes that face organizations seeking a local broadcast license from government authorities. The workshop was attended by over 10 institutions. CEMCA has also published a basic manual for audio streaming and establishing a web radio station, using open source software tools, written by Gram Vaani’s Zahir Koradia. Accompanying the book is a DVD containing all the related enabling software. The manual is also available in PDF and ePub versions from both COL’s and CEMCA’s websites (CC-BY-SA).